Ok, so Rosie the Robot may still be a few iterations away, but the rest of your house, from your doorbell to your toaster, is about to get much, much, smarter. The main problem with existing home automation systems is that there is no agreed-upon standard. Most every company in the market employs a proprietary command system atop either a zigbee, z-wave, or wi-fi connection, none of which can interconnect. That means unless you want to build and program your own Arduino controllers, you're going to be stuck with buying a whole bunch of disseparate, niche systems—one to your smart doorknob/deadlock, another for your home security system, another for your smart garage door, and so on. Lowes announced today that it's rolling out a new all-in-one home security and automation system, dubbed the Iris, that will be able to integrate with and control any home automation device that runs on at least one of the three industry standards. No that's not Siri backwards—well, it is, but not intentionally—it's a smart phone-controlled, home-wide C&C system. But who's got the patience and drive space to install up to a dozen or more individual apps to control singular functions in their house? The Iris hub-based home automation system—which can command everything from your door locks and light bulbs to pet doors and thermostats—is built off the cloud-based system implemented by the UK-based Alert Me home monitoring service. Iris comes in three varieties—the Safe & Secure package, which includes a programmable door lock, a pair of motion and contact sensors, and remote keypad; the Comfort & Control system, which monitors the energy usage and state of the home's thermostat as well as individual appliances through the use of power line internet connected "smart plugs"; and the Smart Kit, which combines both kits. The S&S and C&C kits retail for $180 apiece while the full kit goes for a solid $300. Each set is built around a centra connected hub capable of managing up to a hundred individual devices. 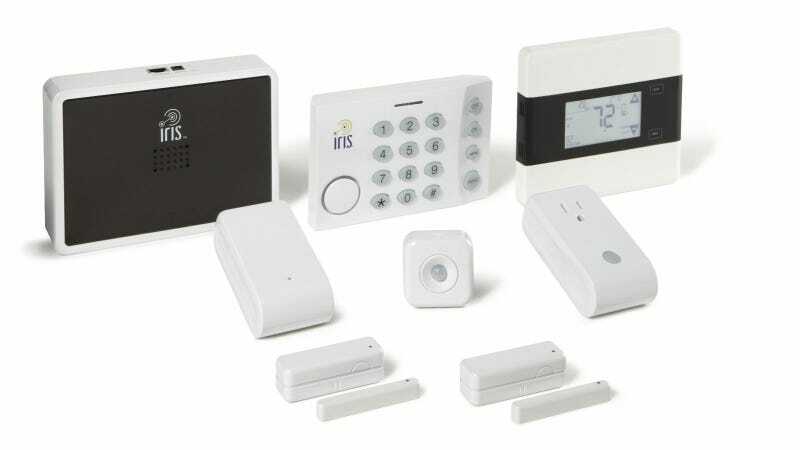 At its release, the Iris kits includes features such as programmable lights and switches, remote thermostats and tweeting doggy doors, security cameras and motion sensors. In addition, every sensor also includes a temperature sensor to better pinpoint the origination points of domestic fires. Beyond that, ongoing monitoring service is either free for the basic level or $10 a month for the premium service. The difference between the two is that for the free service, the homeowner can only toggle the on-off state of an appliance and monitor its energy usage. Premium users can not only see if an appliance is on but also dictate its behavior (turn on at 6pm, off at 10pm, but turn on regardless if I my personal key fob comes within range).